Fuji Heavy Industries Ltd., the Beijing International Motor Show 2012 to be held onthe 12th (Press Day - 24 April 23, Sun and public Trade Day May 2 - 5 April 25) in April in Beijing, China to, will exhibit the “Legacy 2013 model year” of Chinaspecification. Legacy type 2013, the theme of design, environment, fuel economy, driving, safety and security across the four areas of the “full performance model change”, has undergone a large-scale improvements. The model for China has a strong sense of volume by finding the difference thattaking into account the market characteristics, as well as give the exterior design shown an overwhelming presence, increase the height of the car. Beijing Motor Show In addition to this, in addition to reference exhibit the ”SubaruBRZ” will debut in China, will exhibit the new rally car will compete in China in 2012.In addition, the press briefing is scheduled to perform at the Subaru booth on Monday23 April. 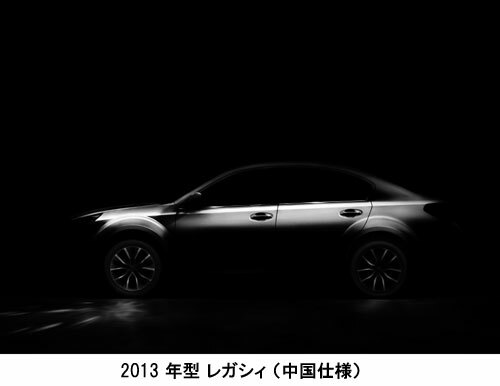 In the Subaru global site (http://www.subaru-global.com/ms2012/beijing/), opened asite dedicated April 6, from 11 today, including the teaser image of the “LEGACY2013 model year”, the future , is scheduled to deliver information, such as the press conference.